50 acre West Side estate with outstanding Mediterranean single level home. This beautiful home features 6300 square feet of living space, 4 bedrooms with 4 baths a pool, chicken coop, view pavilion and a lovely 2 bedroom separate guest house. 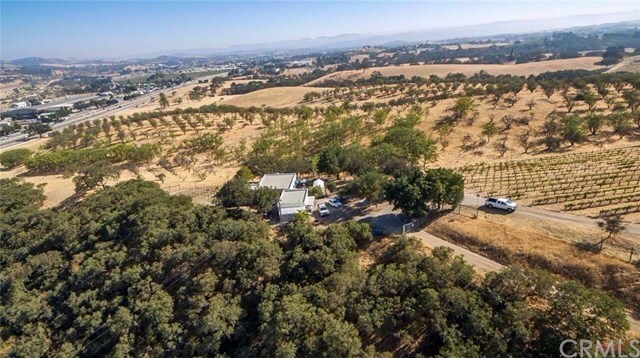 Breathtaking 360 degree views from this hilltop home which is located just 5 minutes from downtown Paso Robles. French doors throughout, high ceilings, saltillo tile floors, hard wood cabinetry, granite counter tops, two fire places in the main home and one in the guest house. The estate also offers a pool, spa & brick patios all of which can be accessed from all areas of the house. In addition there is an inside laundry & an office off the master bedroom. The large walk out basement has a bedroom/office, bath, living room & wine cellar. The 3 car garage. Nicely appointed guest house is in a private setting. Vineyards are currently not producing. 3 APNs included in sale 018-281-010, 011, 014. Lot Description: 3 parcels included. Information deemed reliable but not verified.